Why businesses should use a Google Apps consultant? Google Apps consultants help businesses do what they need to do – that is focus on their businesses but still get the IT solutions they need. As a consultant brings expertise that isn’t available in-house either because of skill or resource constraints. Google Apps is a set of tools that totally replaces the Microsoft Office Suite and it’s all cloud based. Coupled with Gmail for business this gives a business the opportunity to have great collaborative tools without extreme expense, in fact a very modest pay as you go monthly fee based on number of users. A Google Apps consultant is someone that is experienced in implementing Google Apps into businesses. It is not just the technical work of setting up Google Apps, actually the technical work is fairly straightforward, what’s slightly more complicated is the change management, bringing in a new set of tools into your business, if you have more than a couple of employees, can be quite tricky. A Google Apps consultant is experienced in change management and the issues that arise from a new set of tools, this experience also can include coaching and training or more sophisticated techniques such as creating champions within your business. 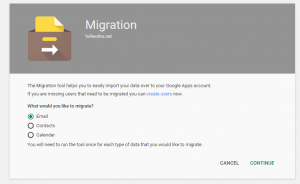 Once you engage a Google Apps consultant they will be able to set out a whole migration plan for you and set out the success factors and measures for your implementation. Using a Google Apps consultant makes for better approach to change of business solutions because if you try and do it all yourself you’ll be learning the first time and you’ll be making the mistakes that a consultant has seen 100 times before, knows the pitfalls and is able to avoid, so using a Google Apps consultant is something that all businesses that are planning to migrate to Google apps should consider seriously. the Google Apps consultant will will have knowledge of complementary tools and be able to advise you the best fit of tools within your environment beyond the Google Apps solutions. the Google Apps consultant most likely is from a Google Apps partner, and a partner will be able to provide you enhanced long-term support and assistance such as provision of backup solutions. Just as a reminder of what Google apps for work actually gives you: Google apps for work covers a range of business tools the one that is most well known is Gmail for work, this is a first-class email tool and can eliminate the need for any in house servers such as exchange servers. The next most important part of the Google Apps suite is what is collectively known as Drive. Google Drive provides a cloud storage solution but coupled with the cloud storage solution comes a set of office automation tools, such as Docs ( which is a word processor ), Sheets ( which is a spreadsheet ) Slides ( which is for presentations) and many more tools. This is the first post of mine relating to Google Apps for Works, or as it used to be called Google Apps for Business. The subject of this post is moving email to Google Apps and I am writing a few notes, based on my experience of doing many moves. I’ll assume that you have already set up you Google Apps for Works account, if not do it here https://goo.gl/McyvgA , it is free to set up and free for 30 days so no reason not to. When you set up a new account, it will guide you through the verification of your domain and setting up of mail exchange (MX) records, depending on your technical skills this may be easy or a challenge. Google try and make it easy as a step by step process, and there is help at the end of a phone, however if you prefer you can get a company like fullworks.net do it it for you, you may find they even have offers that make it a cheaper and better way too. Once you are set up correctly, and added the users you need, any new emails will flow through to your new Google Apps Gmail accounts. Job done! – Well not quite, as if you are like most people you probably have a history of old emails that you want transferred across. 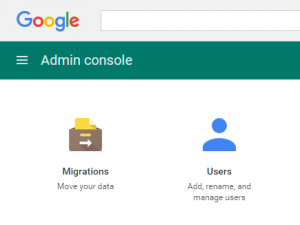 Again Google try to make this easy, inside your Google Apps admin panel is a migration icon. 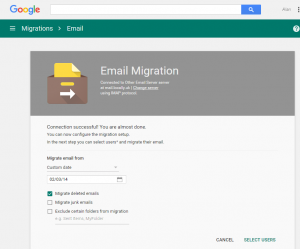 The migra tion tool helps you easily import your data and has options for Email, Contacts & Calendar. Depending on where your Email is kept, you will have to provide the correct access. In most cases this is the IMAP server, user name and password for your old Email. Once successfully connected, you have an option to provide a from date, which by default is 6 months. Be careful, you probably have a lot more older emails, so check (all folders and users you are planning to migrate!) before continuing. I like to select custom a migration date. The next step is to SELECT USERS, where you select the Google Apps users that you want to receive the emails ( I assume you have set one up prior to this stage, but if you haven’t you can open a new tab – keeping the existing one open and create a Google Apps user ). You can select one, or several users. You will be asked for their individual server username and password (you may have provided this earlier). Once you have input the credentials you can click the run arrow (start migration for selected users). And that is about it, you will get a progress indicator and a request to refresh the browser for status updates. The migration service isn’t fast, so don’t spend too much time looking at the screen. Screenshots include Google trademarks. © 2015 Google Inc. All rights reserved. Google and the Google Logo are registered trademarks of Google Inc.